Health Canada has the ability to prevent existing licenses from being cancelled if an agreed upon MDSAP strategy is reached between Health Canada and the manufacturer by December 31, 2018, but Health Canada is not able to reinstate cancelled licenses even if an MDSAP strategy is agreed on between Health Canada and the manufacturer before December 31, 2018. Therefore, it is critical to submit your “2018-2019 License Renewal Package” to Health Canada before the December 7, 2018 deadline even if there is only a small chance you are considering pursuing MDSAP or participating in the December 12, 2018 call. DATES: December 7, 2018 – 2018-2019 License Renewal: If you or your RA designee have received a “2018-2019 License Renewal Package” from Health Canada back in August but have not yet submitted the package to Health Canada requesting renewal of your existing licenses for 2018-2019, please do so immediately. Health Canada has sent out reminders that any license not requested for renewal will be cancelled on December 7, 2018. If you are delaying your 2018-2019 annual license renewal paperwork due to concerns over the implementation of MDSAP please do not allow your license to be cancelled on December 7, submit your renewal package for 2018-2019 immediately before the December 7 deadline. 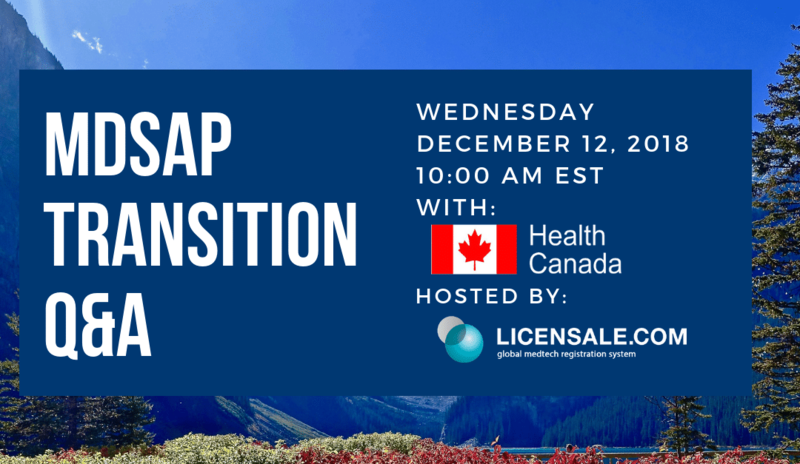 December 12, 2018 – Conference Call with Health Canada, Register Here- https://attendee.gotowebinar.com/register/5468561113840101123: If you have any questions regarding the MDSAP requirements for maintaining your licenses in 2019 please participate in the December 12 Arazy Group/Health Canada Joint Conference Call where you may ask Health Canada specific questions about your unique situation regarding MDSAP transition and get answers or possible resolutions for your situation. Health Canada has agreed to participate in this call to try to find specific solutions for your current MDSAP challenges outside of what has been publicly published. Please participate in this call and ask Health Canada your questions directly. For those participants that submitted their 2018-2019 license renewal packages but may not find an acceptable resolution to their MDSAP questions on the December 12 call, you may always request your licenses by cancelled following the call if it is still desired. It is critical you do not allow your existing licenses to be cancelled on December 7 if you are considering MDSAP transition. December 31, 2018 – CMDCAS Expiration Date: As of January 1, 2019, manufacturers will no longer be able to sell devices in Canada under CMDCAS. Health Canada has publicly published some of the options for manufacturers to provide an MDSAP Certificate or an “MDSAP Transition Package” to demonstrate compliance to the CMDCAS replacement called MDSAP which is mandatory as of January 1, 2019. Due to scheduling, financial burden, and other specific factors that some manufacturers are faced with, neither MDSAP Certification or an acceptable “MDSAP Transition Package” may be obtainable by the December 31, 2018 deadline. The intent of the conference call with Health Canada on December 12 is to give manufacturers the ability to agree with Health Canada on solutions for their situation. December 31, 2018 (unless otherwise agreed with Health Canada on the call) is the deadline to submit the agreed upon MDSAP paperwork to Health Canada in order to maintain license validity in 2019. For these manufacturers the prior two dates must be kept. Manufacturers must submit “2018-2019 License Renewal Package” before the December 7, 2018 deadline in order to prevent existing licenses from being cancelled. Manufacturers must also participate in the December 12, 2018 call with Health Canada (or contact Health Canada in an equivalent manner) to get agreement on their unique and specific MDSAP Transition strategy. *If you only have Class I devices in Canada and do not have a medical device license which requires annual renewal these dates do not apply. Only Class II, III, and IV medical device license holders should be concerned.